It’s spring race season! One of my favorite times of the year. Managing race anxiety and excitement is imperative for success this season, regardless of distance. Marathon, half marathon, 10 miler, 10k and 5k racers can all benefit from the same applied principles when lining up on race day in order to effectively manage race anxiety for optimal performance. Recent research has shown the impact of starting too fast. Conventional wisdom of “Don’t go out too fast” is so often stated that it’s an ingrained idea for many runners. However, there is very little information on WHAT TO DO instead to ensure proper pacing. Managing pre-race anxiety and excitement is one of those key factors. Here’s a step by step guided meditation that you can do in the starting corral or in the days leading to a race to ensure that you arrive calm, focused and ready to execute. The guided version below is 6 minutes long with the steps written out below. 1 Stand Tall. Our posture and body language has a strong effect on our mood and emotions. Standing tall, with shoulders back helps induce a sense of confidence. 2 Breathe. A conventional wisdom piece of advice. But here’s how to breathe. Put one hand over your belly button. Breathe slowly in for a count of 5, then slowly out for a count of 5. Pay attention to your hand. Work to breathe deeply so your hand is moving up and down with each breath. Take at least 3 cycles of breathing in this 5-5 manner. 3 Connect to your surroundings. Continue to breathe slowly, deeply, and mindfully. Reconnecting to your senses is going to help you reduce negative cognitive rumination and help you stay grounded to the present moment. Start by noticing 3 things you can see, looking for small details. Describe in your mind what it is you see, looking for small details in your surroundings, those around you etc. Then notice 3 things you hear. Again, describe in your mind what you hear, looking for small details in your environment. Try to stay focused on the physical properties of what you hear, rather than what people are saying. 4 Connect to gratitude. Connecting to gratitude helps you refocus your energy onto the positive aspects of your race and all it took to get you to the starting line in the first place. Consciously remind yourself of 3 things you are grateful for in that moment. “I am grateful for having the physical ability to be here today. I am grateful for having the opportunity to test my limits. I am grateful for my health.” Be as clear, crisp and genuine as you can. 5 Connect to community. One of the greatest aspects of running is the connection to a larger community all passionately pursuing goals. Waiting in the starting corral or walking around the pre-race expo are both great reminders of this connection. Be present with those around you, appreciating the presence of the others lining up. Be reminded of all the people who made it present for you to be at the starting line today. Be thankful for your coach, your team, your family, your support system. Picture those individuals in your mind and give them a quick internal recognition of thanks. 6 Re-frame anxiety. Many runners try to not be anxious. This is going to backfire each and every time. Pre-race excitement is necessary for optimal performance. Cognitively appraise the internal sensations in a positive way is important. Positive self talk about what you’re feeling with statements of, “This means I’m ready and prepared for the task at hand,” “I’m excited about being able to run well today,” “This is not anxiety, this is excitement, which means I’m going to perform at my best” are going to help you settle down and focus. It also helps you be in charge of your thoughts, rather than the thoughts being in charge of you. 7 “I am” Statements. Now it’s time to redirect your focus on what you are planning to do today. Be crisp about these thoughts, making them “I am” intentions as clear as you can make them: “I am going to manage my pace,” “I am going to run __________ splits for the first ______ miles,” “I am going to ensure that I control what I can and let go of the rest.” These are just ideas. Make them specific and genuine to you. These statements help you dial in your focus for your race day strategy. 8 Three big deep breaths. Finally, close this practice by reconnecting to the physical sensations of your breath, feeling that hand on your belly button. Now, intentionally take 3 slower, deeper breaths, as big as you can make them. You’re ready! Remember, you’re not suppose to not feel anxious at the beginning of a race. How you handle the pre-race excitement that coincides race anxiety will go a long way in helping you perform optimally. I wish everyone well this racing season! Dr. Justin Ross is a clinical psychologist specializing in sports performance psychology. 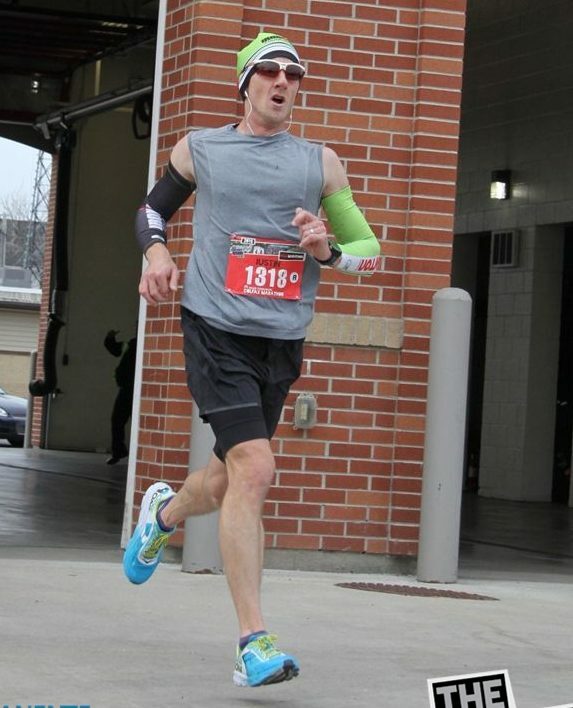 He recently ran his first Boston Marathon. He enjoys helping others push limits and hone the necessary mental skills for optimal performance.